As a growing leader, part of your mission is to inspire the people around you to push themselves – and, in turn, their team – to greatness. To do this, you must show them the way by doing it yourself. We must not ask or expect our team to do what we cannot, will not, or do not do ourselves. We must live what we preach to others. When leaders don’t “practice what they preach,” it can be almost impossible for a team to work together successfully. How can anyone trust a leader who talks about one thing, but does another? When you lead by example, you create a picture of what’s possible. 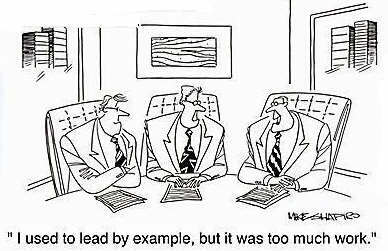 People can look at you and say, “Well, if he can do it, I can do it.” When you lead by example, you make it easy for others to follow you. What does this mean for you? If you give yourself to your team and show them the way, then, most likely, they’ll follow you anywhere. The article below explains some aspects of our power as we grow into leadership. Years ago, I had a very difficult boss. One-on-one he wasn’t a bad guy. He was warm and likable. But in a group—particularly in meetings—he become another person. Dr. Jekyll became Mr. Hyde. I was very much aware of the impact he had on me. I vowed I would never lead this way when I got promoted. People are aware of our role. As much as we may want to be “just one of the troops,” our people can’t separate us from our role in the organization. Even if it’s only subconscious, they know we can advance, hold back, or derail their careers. This colors their perception and interactions with us. People notice our behavior. This is easy to forget. When I was just beginning my career, I noticed how my boss treated his assistant, whether or not he was punctual to meetings, and what he did when he was angry. So did my colleagues. We often spoke of it to one another. We noticed the most trivial details. People amplify our words and actions. This is the scary part. We may think we are just being firm, but our people see us as angry. “He chewed me out,” she reports to her friends. Or we ask a question, and our people interpret this as a lack of trust. Everything gets dialed up a click or two. People create stories to explain our behavior. This is just human nature. We inherently try to see the patterns behind the facts and create meaning. Sometimes we get the story right; often we get it wrong. Regardless, we knit together the facts and create narratives to make sense of our world. As leaders, we don’t need to resist these truths. Instead, we need to be intentional with our words and actions, aware we are constantly modeling what we believe and expect. It’s not unlike parenting. More is caught than taught. This is a challenge but also a great opportunity.